You have one week until the big day, so how are you planning on spending it? A romantic candlelit dinner for two beside an open fire place or a countryside stroll with a picnic basket and rug, hand in hand with your loved one. Whatever you do this Valentine’s Day make sure you make it one to remember. If you are still searching for the perfect valentine’s gift we can help: treat your loved one to a special gift(s) from Wineware. We have a broad range of gifts on offer; Valentine’s Day gifts for her or Valentine’s Day gifts for him. Choose from high-quality Champagne glasses to toast your valentine’s anniversary, or choose from a wide selection of wine accessories to make your evening relaxing (and run smoothly without any hiccups). Ever had the mishap of searching for a corkscrew to open that special bottle and end up spending five minutes rummaging through a drawer? This can kill the mood so make sure you are prepared for 14th February 2013. We have included some of our top tips for Valentine’s Day below the gift ideas. If you need any further information or advice about any of the products listed then speak to one of our knowledgeable advisors on 01903 786148. Raise a special toast to a very happy future for the two of you. We suggest serving your Champagne with strawberries on the side. These distinctive Champagne Saucers from LSA are handmade and supplied in a classic gift box. Cocktail glasses are a girl’s best friend and make for an extremely thoughtful present for your loved one. This set of 4 cocktail glasses is ideal for having a girl’s night in or celebrating a special occasion. We guarantee she will love this glassware set! 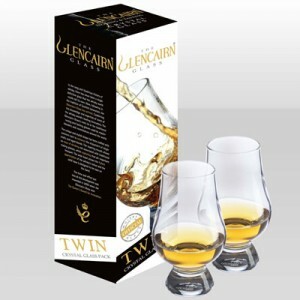 If you know he is a whisky drinker then you cannot go wrong buying him this whisky set. The Glencairn Whisky Glass is known as the definitive glass for whisky tastings and is used by master blenders and connoisseurs around the world. 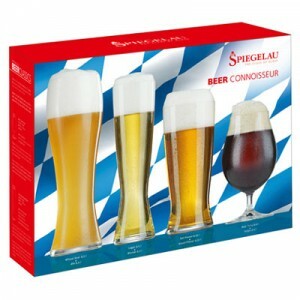 This is beer set includes four different glasses for drinking; lager, wheat beer, stemmed pilsner and tall pilsner. These are the ultimate glasses for beer enjoyment and make for a fantastic gift for your partner, husband or boyfriend. Click here for our full selection of gifts. Alternatively why not opt for a Wineware gift voucher to take away the pressure and worry of giving the wrong gift! Gift vouchers are available for £10, £25 & £50. – If you are going for a meal in a restaurant or bar make sure you book ahead. Valentine’s Day and the following weekend are always extremely popular. – If you are cooking a meal in the home make sure you have all the food and drinks accessories you need. This includes the invaluable wine corkscrew! We have a wine corkscrew for her and for him. – Why not buy a special bottle of wine for the occasion? Visit your local wine merchant or shop for advice on pairing wine with food. – Visit The Food Network for a whole range of recipe ideas and suggestions. Wineware wish you a wonderful Valentine’s Day and remember we always love to hear from.